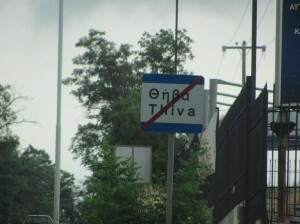 I was never as happy as when I saw the “Leaving Thiva” sign. …even if all the roads don’t. I seem to be destined to get lost in Thiva (Thebes). The first time I ever drove in Greece, Thiva was my downfall. I’d done fine getting myself out of Athens and onto the national road (highway). At Thiva, I needed to head west toward Delphi (aka Δελφοί as shown on most of the signs). But no matter how faithfully I followed the signs, once I was on a road out of town, the road had me headed back to Athens or to Chalkidiki or some other place I knew wasn’t on my route. I drove in and out of town numerous times, then tried to ask someone for directions (though he couldn’t decipher my English rendition of “Road? Delphi?). It was sheer chance that I found my way out of Thiva and onto a road that led to Delphi before I started pounding my head against the car in frustration. Twenty-two years later, my plan was to head from Delphi to Nafplion. Again, Thiva was a critical turning point where I’d head south toward Elefsina and the road to the Peloponnese. All went well at first. I followed the signs toward Elefsina, but then suddenly I was headed toward Chalkidiki. 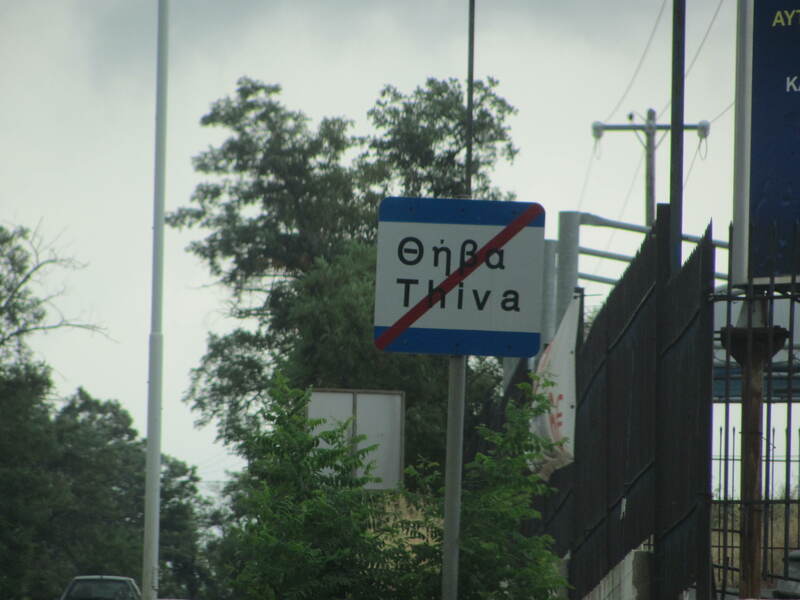 I drove back into Thiva, followed different signs pointed toward Elefsina, and was suddenly headed back to Delphi. I drove back into town, followed the signs for Elefsina again, but found myself headed to the national road toward Athens. Despite all the signs for Elefsina, no roads seemed to lead there, and once again I felt like a rat in a Thivan maze. I was ready to give up in defeat and go back to Athens (a longer route, but one that would ultimately take me where I wanted to be), when I remembered my phone’s GPS. I have mixed feelings about GPS. Usually, I prefer to use a map and figure things out on my own. But unable to escape Thiva, I was ready to give in. This time, following the phone’s charted route of unpredictable twists and turns that didn’t match any of the road signs, I wound my way through Thiva without a hitch and found myself heading south as planned. Victory! Until I realized that the road signs were once again pointing toward Athens. Had I gotten on the wrong road after all? But no, my GPS assured me I was in the right place. In typical Greek road sign fashion, they were very unhelpful as actual navigational guides. It’s a little like driving south on I-5 through Washington state with the highway signs saying “Next stop, Phoenix.” True, if you drive far enough south and hang a left, that route will take you to Phoenix, but it’s not really helpful in knowing you’re actually headed toward Oregon. Ignoring the Greek road signs and trusting in my phone, I was content in the knowledge I was on the right road. With the extra luck of finding a store with yummy chocolate cookies and a clean bathroom, I continued on my way. For once, loving GPS—clearly the only way to navigate in Greece.